Available on select Friday nights from 5:00 pm - 9:00 pm. Looking for an easy and fun way to raise cash for your school, church, team or troop? Fundraising opportunities are now available at Wild Chutes Snow Tubing! 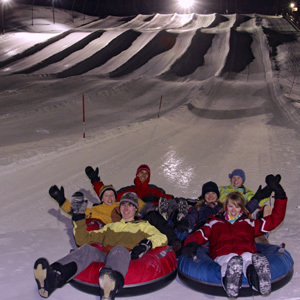 Bring your group snow tubing and earn $5.00 per person, for your non-profit organization! Tickets are $18.00 per person for unlimited tubing from 5:00- 9:00 pm on the date you select, $5.00 for each ticket will go back to your organization, with a minimum of 20 paid participants. Select a date for your event, get it booked, promote the occasion, and have fun raising funds! Please contact a Group Sales representative today for more details or to book your date!